In the case where a primary containment liner fails, a secondary containment liner is put in place to prevent exposure. If for any reason you have any questions or comments about a secondary containment liner system, feel free to give us a call at 1-800-874-0166 or fill out the form on this page and a representative will respond shortly. With increasing environmental concerns, a secondary containment liner is required for hazardous liquids. Fab-Seal specializes in liners for many uses that require the storage of non-hazardous and hazardous materials. PVC, or Polyvinyl chloride, is the best at safeguarding against acids and alkalis. PVC is great for resisting a variety of corrosive chemicals. Our radio frequency sealing technology is one of a kind and will save significant down time during the installation of your secondary containment liner. Primary containment liners can fall short ten to fifteen years after installation, which is why an industrial quality secondary containment liner is so important. Fab-Seal has offered expert design, fabrication and installation of a secondary containment liner for over 3 decades and there is no tank is too big or too small, Fab-Seal can customize a secondary containment liner for any size tank. 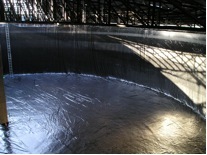 Trust the industry leaders at Fab-Seal with all your industrial containment liner system needs. Fab-Seal can provide a secondary containment liner system that is very reasonably priced compared to our competitors and our trained and experienced professional technicians will get the job done on time and on budget. If for any reason you have any questions or comments about a secondary containment liner, feel free to fill out the form on this page and an associate will respond shortly or give us a call at 1-800-874-0166 to speak with a knowledgeable representative. Have a question about Secondary Containment Liners?